Earn a scout patch at Michigan Legacy Art Park! 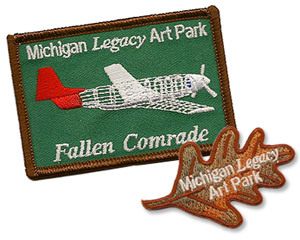 The Art Park offers three patches to scouts of all age groups: the Leaf patch; the Fallen Comrade patch and the Steward patch. To earn a Leaf patch or Fallen Comrade patch, simply download our activity workbooks. Then visit the Art Park, complete the required activities, and drop it in the mail to earn your patch! The Steward patch can be earned by volunteering in the park, by helping with community service projects that range from Art Park clean-up to helping maintain the artwork. For more information on setting up a visit to the park and earning the Steward patch, contact Patricia Innis.